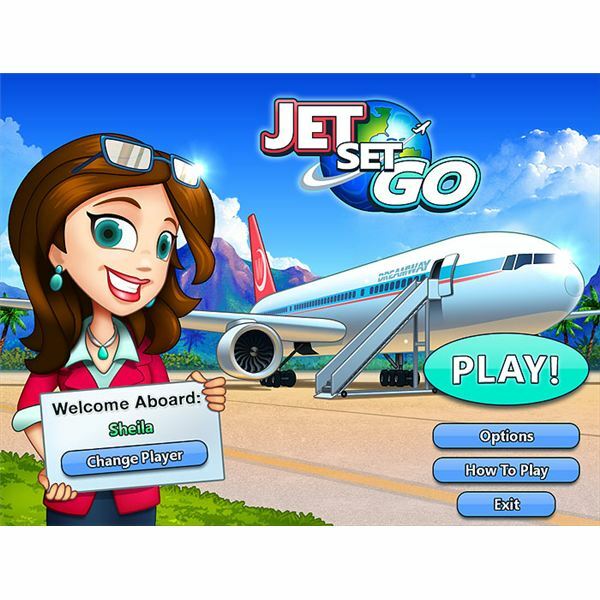 The majority of Jet Set Go gameplay is working directly with a travel agency to make reservations for customers that arrive at your store location. The agency has several stations that will provide different services to your customer. What the customer wants can be identified by thought bubbles that show the image of the appropriate service station that they need. Drag and drop the customer to the station. At each station, different actions will need to be completed to finish the service. Activate your characters interaction with the station by clicking on it directly while the customer is seated. At the brochure stations (the red chairs), your character will simply give the customer brochures to look at. Another service is helping the customer choose where they would like to go on their vacation. When you click on the occupied station (blue chairs), a pop up window will appear. You will need to click on the button in this window (which displays different vacation locations) until your customer has a happy expression on their face. At this point you will click the “Confirm” button. The booking hotel and/or activities station (purple chairs) also involves the same type of actions except the choices will be different. Some busy customer types will need help clearing out their schedule. The green chair station will have your character interact with the customer by moving items on their calendar. Once completed, you will need to complete this transaction by pressing the “Confirm” button. Once the customer has chosen their travel plans, they will sometimes need to print out certain travel tickets (yellow station). Interact with this station simply by clicking on it. Your character will use the machine and help the customer print out what they need. When the customer has everything they need, they will visit the cashier station. Click on the station to cause your character to walk over and collect the money. In between levels where you book reservations, upgrades can be purchased with the money you earned. You can purchase items to improve the efficiency of each station along with increasing each customer’s patience. When you earn enough money, you can even hire additional workers to help you with the brochure, cashier and ticketing stations. In between Jet Set Go game levels, you will see a screen that shows you the current score for Excitement, Appeal and Travel. The Excitement score is based on how quickly you were able to help the customer while keeping them happy during the travel agency levels. The Excitement score determines your current travel agency’s success. Once this score has been maxed out, a new travel agency location will become available. As you complete the travel agency levels, points are earned based on your game performance. Notice that each customer has star icons beneath them. When you provide fast customer service and keep them happy, more yellow stars will display. This indicates that you have generated excitement in that customer, earning you two things – more money when the customer visits the cashier and a higher Excitement score. The Travel score is based on how many flight reservations you have made. Each location that is available to you at the travel agency has a limited number of seats per flight. Once you have successfully booked enough flights to fill up a plane, you will able to play Travel game levels that involve your character interacting with customers during their vacation. The Appeal score is based on the look and convenience of your travel agency. Buying new items will increase this score and fill up the Appeal bar. These game levels involve your character traveling with customers to their vacation destinations and acting as a sort of hostess or guide. As mentioned, these levels become available after a flight to a location is full. Depending on the travel location, you will interact with the customer by providing different services. This works similar to actions in the travel agency. Some places will require serving food or drinks (like a mini Diner Dash level). Other locations include taking photographs of customers, coordinating dance moves, giving information, helping them use a telescope or guiding them to relaxing pool or beach locations. The success of these levels depends on how quickly you provide good customer service along with keeping them in a happy mood. The key to getting good scores in the Jet Set Go game is by closely watching your customers' mood. Each type of customer will have different levels of patience. You will see them losing patience as yellow and blue stars disappear. When you have lots of customers, it can be a little challenging to keep them all happy. Keep these tips in mind. Most of the time, customers will require help from multiple stations. Help a customer in one station and move them to the next station they need. This will temporarily boost their mood. At this point, help another customer and repeat the same action. Upgrade the waiting seats and brochure stations first. Upgrades to the waiting chairs make them more comfortable. Upgrades to the brochure station improve customer patience and help them make their choices faster. If you see a red exclamation icon above a customer’s head, they are extremely impatient and are close to leaving. Help them quickly. You will lose the level (reservation or travel) if three customers leave. When hiring employees, choosing the cashier first is best. This will free you up to help customers on busy levels and prevent the cashier line from getting too full. Your second employee should be the brochure station and then the yellow ticketing station. The most impatient customers are the Diva, Business Man and Shopaholic. When they are first introduced to the game, a brief overview is given about their personality. The most patient customers are the Senior and the Surfer guy. They can wait a bit longer than the rest. The upgrade for the purple booking station (hotels/attractions) will give you more than one “happy” choice for the customer. Always shoot for the more expensive one to generate more profits. When taking photographs for passports and travel locations, scroll to the green bar quickly to take a sharp picture and complete the mini-level. Earn different trophies for completing certain tasks a specific number of times, buying enough upgrades or earning enough money. These trophies do not unlock anything else in the game. They simply give you bragging rights. 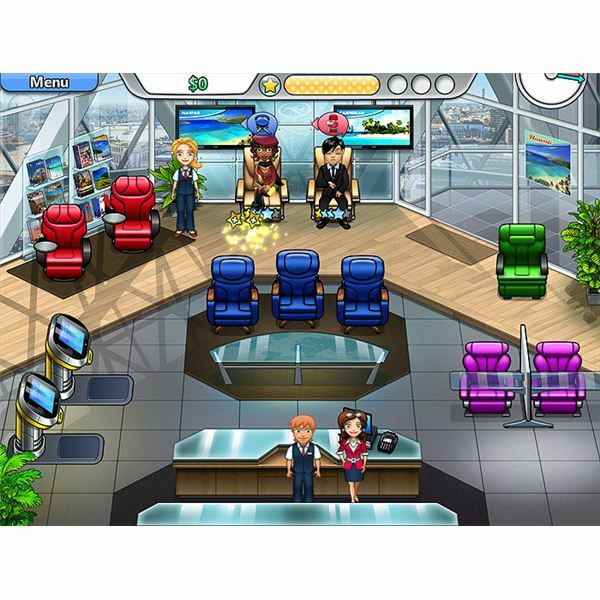 Screenshots of Jet Set Go created by Sheila Robinson. Information in this article is based on Sheila Robinson's gameplay.